« The moon in 3D! You’d think that getting a decent picture of the full moon would be a cinch; after all, it comes around every month. The trouble is, there is a fairly narrow window in which the moon is precisely full (i.e., completely lit from edge to edge), and a couple of days on either side in which it is not-exactly-full-but-close. NEFBC moons look pretty to the naked eye but photographically they elicit pity mingled with contempt: “Ah, I see that you were trying for the full moon there. 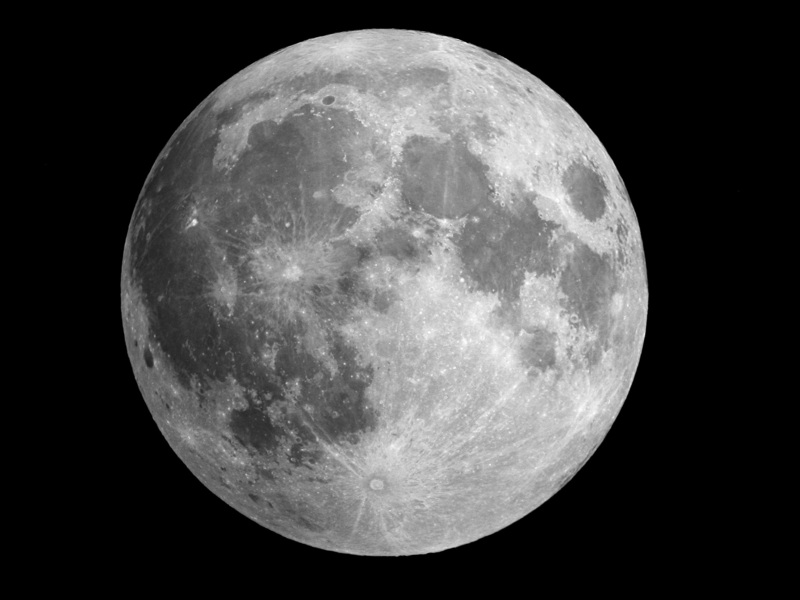 Bummer, dude.” Most of my previous full moon shots have fallen into that latter category. The evening of January 29th was just about perfect. For one, the moon reached its fullest when it was centered right over western North America, dead in my sights. It doesn’t matter how still the atmosphere or how good your camera, if the moon maxes out while it’s over Sri Lanka but you’re in California, it’ll be in NEFBC territory by the time it gets to you (or, more accurately, by the time you get to it). Also, the atmosphere was nice and still. It definitely helped that I was shooting in the middle of the night. When the moon (or anything else) is at its highest point in the sky, you look through the thinnest skin of atmosphere to see it, so there’s less opportunity for bad seeing to spoil the view. Also, by midnight the ground, buildings, roads, and so on have had lots of time to give up their daytime heat, so there’s less stirring of the atmospheric pot. To get the one at top, I did some fiddling in GIMP (still awesome, still free). First, a light application of Unsharp Mask to punch up the fine details. Be very careful about overusing this one, it is easy to do and oversharpened pictures look worse than raw ones. The biggest giveaway is artificial brightening of any high-contrast boundaries, which in the case of the moon and planets means a ring around the edge. Second, I converted the image from color to grayscale, which keeps the colored pixels from getting tweaked into grossness by the next step. Finally and most importantly, I used Curves to adjust the colors. Curves is sort of like Brightness and Contrast on steroids; you can hold some values constant and brighten or darken other selectively. It is hands down my most used image processing tool. Feel free to download GIMP and the raw file above and play around. Better yet, get your point-and-shoot camera and binoculars or telescope and take your own moon photos to mess with. If you haven’t seen Mars, it’s not too late, but now that we’re past opposition it’s a little farther away and a smidgen smaller every night. So don’t tarry. Hi there. I love your photo’s 🙂 I was wondering if i could have your permission to use one of your full moon ones from this post in my Honours years film i am creating?. Trudy Gordine. Thanks for the kind words. As long as you credit me for them, please feel free to use them! I am using electron binoculars 15×70 for astro. But can’t see things clear though live in no-pollution place. Trying 2 buy a digital camera 26x zoom for digiscoping. Don’t know if that works.